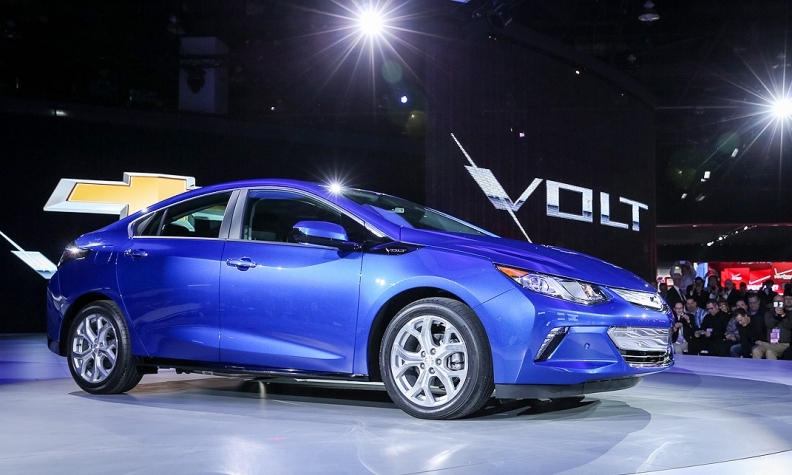 DETROIT -- General Motors could supply the gasoline-electric powertrain used in the redesigned 2016 Chevrolet Volt to other automakers, said GM's global powertrain chief, Dan Nicholson. "We want to be the partner of choice in propulsion system development in this complex and turbulent era we are approaching," Nicholson said on the sidelines of the opening of GM's Powertrain Performance and Racing Center in Pontiac, Mich.
Access to GM's hybrid technology could be a lifeline for smaller automakers lagging in electrification, such as Fiat Chrysler, Subaru, Mazda, Mitsubishi and Jaguar Land Rover. A ready-made hybrid powertrain could save those companies billions in development, labor and manufacturing costs. It also could shave years off the time needed to bring a hybrid vehicle to market. The Volt's entire hybrid powertrain -- the 1.5-liter four-cylinder engine, electric transaxle and the power electronics -- fits under the hood of a compact car. To adapt the powertrain to another car, an automaker would need to find space to package the batteries, and likely would be responsible for calibration. Supplying the Volt's powertrain to other automakers would enable GM to cut its own costs. Nicholson added: "We have a history of being a good partner."